The last big news we heard about The Batman was that director Matt Reeves met with Jake Gyllenhaal to play the Dark Knight. Ultimately he passed and decided to move on to Spider-Man: Far From Home, but a new rumor gives us another name that Reeves met with as well as new details about the movie. Revenge of the Fans says that Reeves also met with 35-year-old actor Jack Huston about playing Batman. But then the Batman in Reeves’ script got younger. He’s now looking for someone to play a 25 to 30 year-old Batman in a movie that will take inspiration from the classic “Batman: Year One” comic. If you’re not familiar with that book, here’s a synopsis. And speaking of Jack Huston, Revenge of the Fans says that while he won’t end up playing Batman, it is possible that he could be playing Harvey Dent, who is rumored to be in the movie along with The Penguin. This is just a rumor that should be taken with a huge grain of salt until we start hearing similar things from more reliable sources. 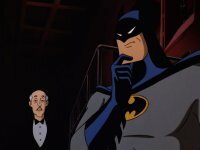 But what would you think about The Batman taking inspiration from “Batman: Year One” and featuring a younger Batman? Let me know in the comments below.